Today marks five years since my youngest brother passed away. He went on a day trip into the Bush, his group missed the exit they needed and got lost, unfortunately Nick died in a freak accident just hours before the rest were rescued. The whole event lasted three days. The day of the trip followed by two days of searching. For me the first day was completely normal, I had no idea anything was wrong until I got home late that evening and my parents told me that the group hadn't returned and we didn't know why. The second day I went to work but was particularly unproductive as I spent the day desperately waiting for a call telling me that they had been found. On the third and final day I went to the mountain they had set out from, to wait with my family as well as the families of the others in the group up there, where the search was being organised and coordinated. A few days ago, while I was back in Sydney I went with my parents on their yearly trip to Mt Wilson. It was the first time I have ever been back there. That area holds some very painful memories for me, despite having spent less than a day there. 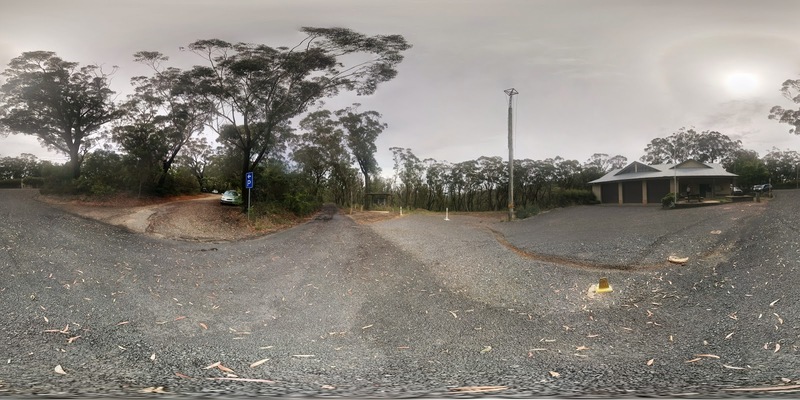 On the right is a photosphere showing the fire station and the car park. It was that area I spent the entire day. I can still picture where the major vehicles were, where the rescue workers congregated. I can picture in the inside of the fire station building and where I sat with my family and talked and waited. I can picture the office we were gathered in when the police told us that they group had been found and that it appeared that unfortunately one of them had died. I can remember the desperate hope that the police were mistaken, that maybe one of them was just injured and the heart shattering news when we found out exactly who had been lost. For me standing there and looking back those are the memories that come rushing back. The irony of all this is that to Nick and the rest of them I suspect the fire station was a minor landmark in the journey. It was where they parked the car and set out from and the car would have been their ultimate goal, but for them looking back I really doubt the fire station features prominently. For my parents, the trip out there is a yearly one. It is not exactly a trip they both enjoy, but certainly a trip they both feel obligated to perform. Neither of them were quite able to express why they go, but I don't expect they will stop any time soon. Difficult as it was I am glad I went with them this year. I can't say I expect I will ever go back there though. Once was enough. All that is left to say now is Nick, I miss you and love you.